Earlier this week, production got started in Atlanta on the action-packed sequel Escape Plan 2, with star Sylvester Stallone sending out an intriguing video from the set. Today, we have a first look at Dave Bautista, who is seen brandishing a huge machine gun, along with more behind-the-scenes photos of the Guardians of the Galaxy 2 star. While it hasn't been revealed exactly who he's playing yet, another photo that surfaced on social media reveals the actor has already wrapped after just a few days of shooting. These images have debuted on various Twitter accounts, including those of director Steven C. Miller, director of photography Brandon Cox and Alejandro Lalinde, who revealed on Instagram that Dave Bautista wrapped earlier today, while praising the actor's "grace and humility." The image posted on Brandon Cox's Twitter account shows both Dave Bautista and Sylvester Stallone discussing a scene with director Steven C. Miller, which appears to take place at a bar, although very little has been revealed about what has been shot so far. We also have a new photo from Steven C. Miller's Twitter which features the director going over the script for a prison cell scene with Sylvester Stallone. The set video posted by Sylvester Stallone yesterday also featured a glimpse at a mysterious robot, whom the actor said will have an integral part in the film's ending, although he wouldn't offer any further details. Earlier today, the actor took to Instagram yet again to reveal a new photo himself alongside his new robot friend, while explaining that his character, Ray Breslin, will actually be fighting this metal monster. Here's what Sylvester Stallone had to say in today's Instagram post. "On the set of Escape Plan 2. with my new hardheaded enemy! There was a time when I thought it would never be possible that I would have to go against a robot. Now I don't mind fighting with just about anybody but there's something insane about hitting a techno-thug with a head of metal and no nerves , And certainly no sense of humor, that can take the joy out of one's life. Anyway the shoot is going great in Atlanta! #lionsgate #Atlanta. #robots #metal #guardians of the galaxy"
It was also revealed yesterday that the full title is Escape Plan 2 Hades, although it hasn't been confirmed yet how long production will be happening in Atlanta for, or if Emmett/Furla/Oasis has a release date in mind for this action sequel. Sylvester Stallone and Dave Bautista lead a cast that also includes Jaime King, 50 Cent, who reprises his role as Hush from the first Escape Plan movie, Fall Out Boy front man Pete Wentz and Jesse Metcalfe. Steven C. Miller is directing from a script by Miles Chapman, who co-wrote the original Escape Plan with Jason Keller. The original Escape Plan, which also starred Arnold Schwarzenegger, who doesn't appear to be returning for the sequel, only earned $25.1 million domestically, but it earned an additional $112.1 million worldwide, $40.9 million of which came directly from China. The movie's success in China lead Emmet/Furla/Oasis to set this movie up as an official U.S./Chinese co-production, with EFO producing alongside Mark Canton and Beijing-based Leomus Pictures, under a $20 million budget. 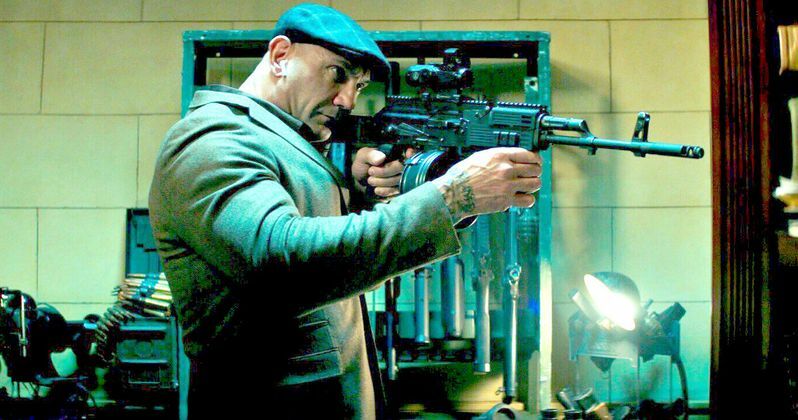 Take a look at the official first look at Dave Bautista in Escape Plan 2, along with the latest photos from the Atlanta set as production continues.